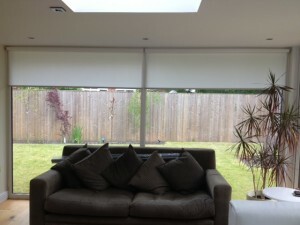 Roller blinds were the obvious choice to meet the need for privacy from neighbours in this home. More and more homes now have full length windows and bi-fold doors to seamlessly link the house and the garden. 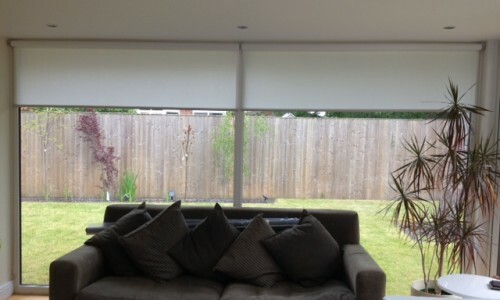 Roller blinds are great options for modern windows and bi-fold doors where there is often limited space above for a track or pole and to the side for curtains to stack back. There is a wide choice of fabrics and trimmings so they can suit both traditional and contemporary settings. In this case we decided against a sheer as that wouldn’t provide privacy at night with the lights on in the house. Instead, the client chose a fabric with a weave and a metal bottom bar. 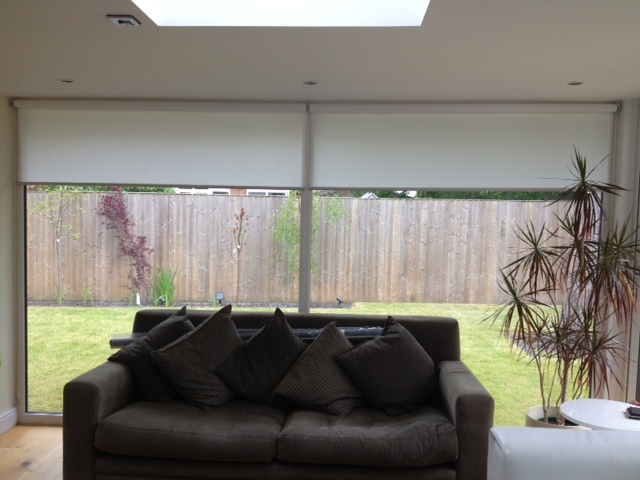 Roller blinds are extremely functional – you can lower them a little to block out glare from the sun without losing your view or too much daylight. Contact Diana Murray Interiors to see a full range of roller blind fabrics and finishes.